Developed by Studio Roosegaarde and designed by Anouk Wipprecht in collaboration with V2_labs, Intimacy 2.0 is a pair of high tech dresses that use new technologies to blur the boundaries between what is private and what is public. The “undressed” body is sensationally exposed in midst of social interactions, transforming a space of “intimacy” into a socio-sphere of “extimacy,” to borrow a neologism coined by Jacques Lacan. The wearer has limited control over the transparency of her garment, constructed from opaque “smart” foils that become increasingly translucent upon personal encounters. The design of the garments themselves are intentionally provocative, with deep plunging necklines on lithe, taut dresses. 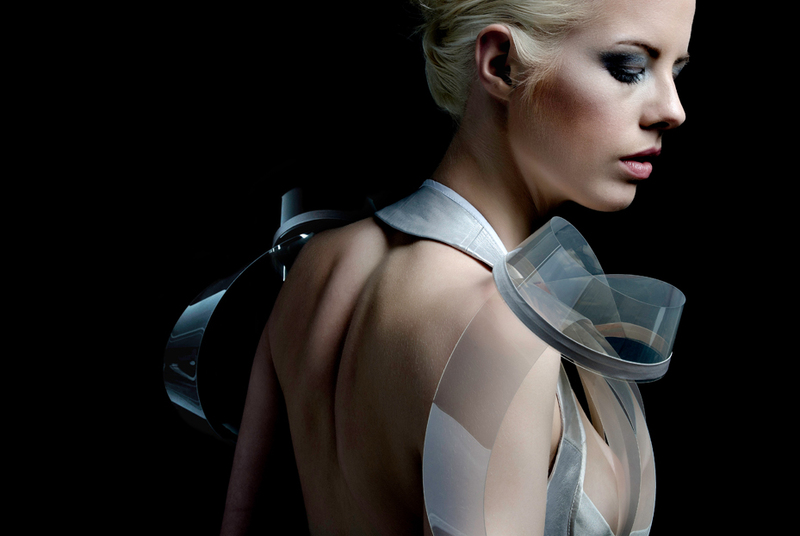 Evolving from previous versions, “Intimacy 2.0” is certainly much more wearable. Intimacy 2.0 certainly provokes: It shifts the role of clothing as merely a protective shield from the natural world to emphasizing its social and cultural function. And, in a society that has more and more of its life intimately entangled with technology, it is not surprising that fashion has come to explore technologies effect on the most private and intimate parts of our lives.